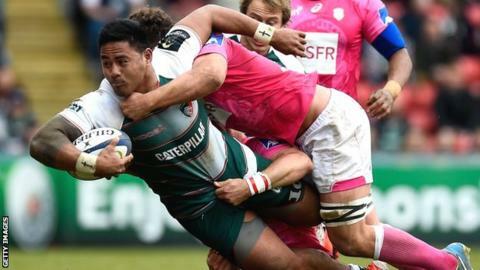 Leicester became the third English side into the European Champions Cup semi-finals as they handed Stade Francais a record European loss. Tigers, into the last four for the first time since 2009, scored first-half tries through Manu Tuilagi, Niki Goneva and Freddie Burns. Julian Dupuy's score for Stade after the break was wiped out as Goneva, Mike Fitzgerald and Telusa Veainu crossed. Tigers will face Racing 92 or reigning champions Toulon in the semi-finals. Wasps and Saracens are already through, and will meet on the weekend of 23rd April at Madejski Stadium. Leicester would make it an all-Premiership final if they get past another French opponent, and on the evidence of this destruction of the reigning Top 14 champions they have every chance. Stade were barely ever in the contest and disintegrated in the face of a ruthless Leicester performance in front of a boisterous Welford Road crowd. Tigers, who have not lifted Europe's premier trophy since their back-to-back successes of 2001 and 2002, were sent on their way when Tuilagi touched down after the sharp-thinking Burns took a quick line-out. Goneva raced down the wing for Tigers' second and Burns, whose 16-point haul was instrumental, landed an interception try before the break. Stade replied as former Tigers scrum-half Dupuy sniped through a gap in a rare sleepy moment for Leicester, but as the game drew on, Australia international centre Peter Betham started to open up the tiring French defence to create openings. Goneva was given the freedom to add his second try of the afternoon and the wing then slipped in Fitzgerald, before Veainu capped a fine solo performance to bring up Leicester's half-dozen. Leicester: Tait; Veainu, Betham, Tuilagi, Goneva; Burns, B Youngs; Ayerza, H Thacker, Cole, Barrow, Kitchener, Fitzgerald, O'Connor, McCaffrey. Replacements: Thompstone for Goneva (69), O Williams for Burns (51), Kitto for B Youngs (68), Mulipola for Ayerza (62), Bateman for H Thacker (60), Balmain for Cole (66), De Chaves for Fitzgerald (68), Croft for McCaffrey (62). Stade Francais: Camara; Vuidarvuwalu, Doumayrou, Danty, Sinzelle; Steyn, Dupuy; Zhvania, Bonfils, Slimani, Pyle, Flanquart, Ross, Lakafia, Parisse. Replacements: Bonneval for Camara (63), Plisson for Steyn (51), Tomas for Dupuy (70), Priso for Zhvania (66), Burden for Bonfils (66), Alo-Emile for Slimani (60), Gabrillagues for Flanquart (34), Alberts for Ross (51).